Last weekend, we invited two of our 6 year old's friends over to have a pumpkin decorating playdate along with our 3 year old twins. 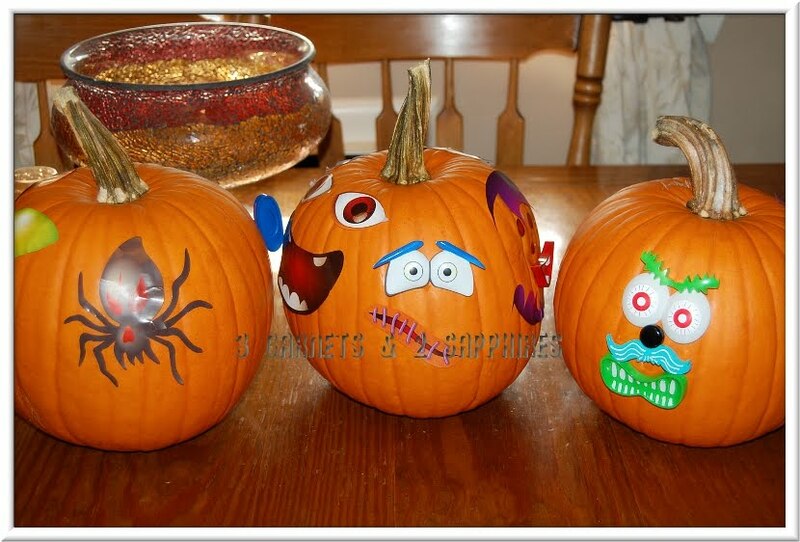 We had a few kid-friendly pumpkin decorating kits from Pumpkin Masters. With such young children, we wanted to avoid any carving so that each child could be as hands-on as possible during this activity. After all, it is much more fun to be a participant than a spectator. We received three kits to try out. We ended up using the Pumpkin Sticker Kit and the Monster Pieces Kit. Neither of these kits involved any carving at all. The Pumpkin Sticker Kit had enough eyes, noses, and mouths to decorate about eight pumpkins. There were also other fun elements, such as spiders, boils, scars, and more. Since some of the stickers were quite large and irregularly shaped, some of the children needed help removing them from the sheets. If they pulled them off too quickly, they risked tearing them. Although we followed the instructions and made sure each pumpkin was clean and dry, some of the stickers adhered very well to the surface of the pumpkins, but some did not. I am wondering if this had anything to do with the texture and curvature of each pumpkin? In any case, it was nothing that a little all-purpose glue could not fix. The Monster Pieces were plastic eyes, noses, mouths, and ears that each had a pointed backing that could be pushed directly into the pumpkins. Although our 3 year olds needed help with this, the three 6 year old children could pierce the pumpkins without our assistance. Even though there were enough pieces to make three faces, the children mixed them with the stickers to make some fun creations. 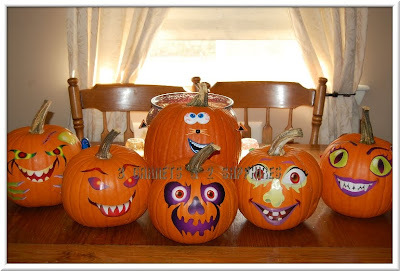 Some of them even turned their pumpkins around to create an entirely different face on the back. We did not use the Follow You Eyes Kit because they worked best with a completely hallowed out pumpkin that is lit from within. We ended up giving this product to a fellow-parent who had plans to carve pumpkins with her family this year. 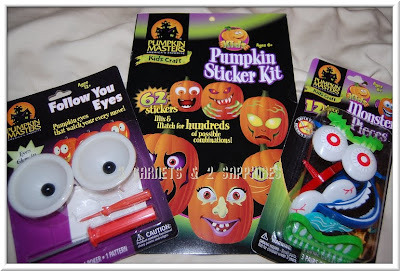 To view the full line of Pumpkin Masters pumpkin decorating kits and accessories, visit PumpkinMasters.com . 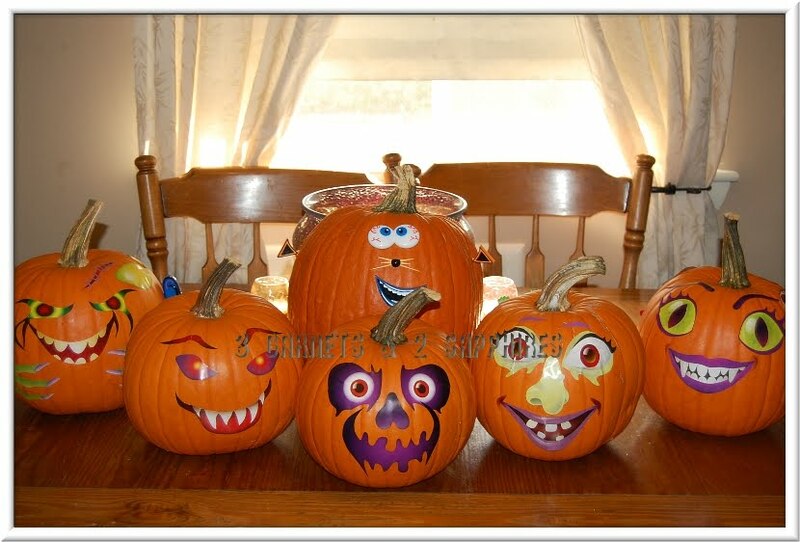 Thank you to Pumpkin Masters for sending us complimentary sample kits to base this review upon.